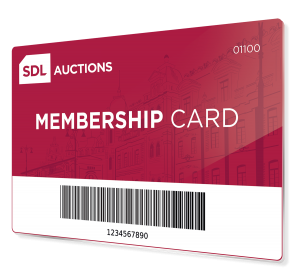 SDL Auctions is delighted to be the first auction network to launch a membership card scheme, offering speedy registration to bidders attending their auction rooms. Membership card holders simply need to show their card for scanning at the dedicated registration desk when they arrive at the auction room, meaning you don’t need to complete a new form every time you attend and you will then be given a bidding paddle. You can register at our auction and your new card will follow in the post. You must have two original forms of identification with you to register. Contact details and identification will be stored on our bespoke cloud-based software however, you will still need to bring your original identification to each auction in the event you are a successful purchaser and need to exchange contracts.